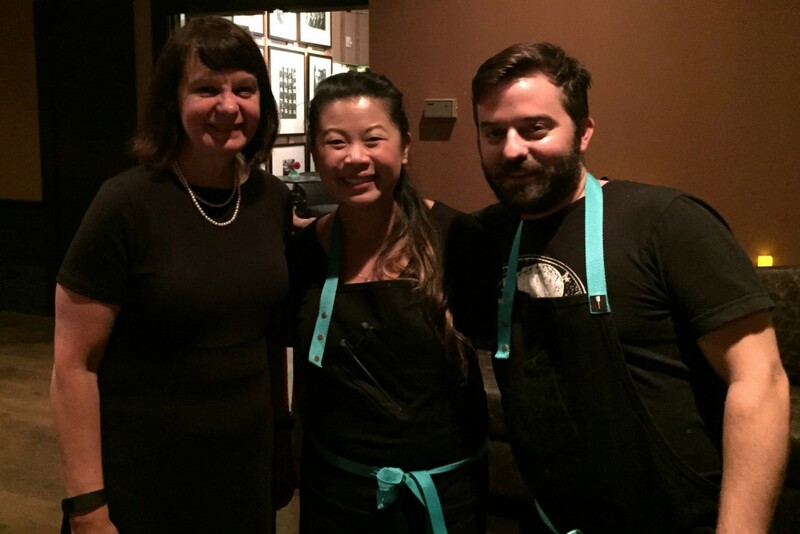 Top Chef season 12 winner Mei Lin is in Portland to cook with her runners-up Doug Adams and Gregory Gourdet. All three will cook for a pre-International Pinot Noir Celebration dinner before IPNC in McMinnville, Oregon. 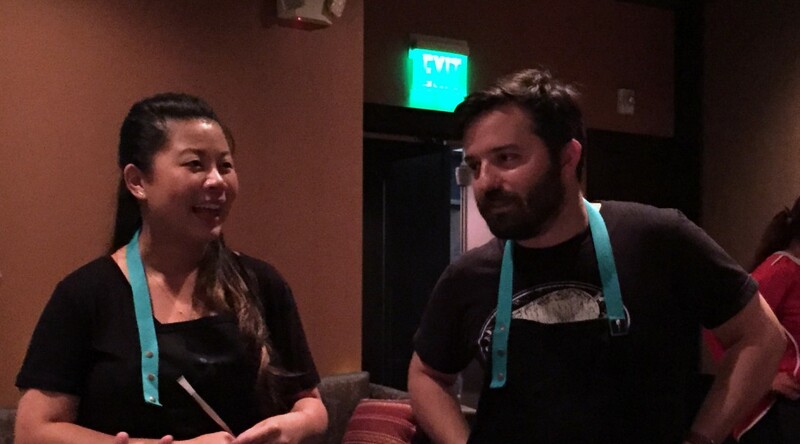 But first it was a great 4-course meal at Imperial in Portland, where she shared the kitchen with Douggie. About 50 diners were served. This was a chance for me to taste her food beyond the single course she did in the blow-out Chef’s Week dinner finale. I was not a fan of her offering, duck layered under beet with blueberry and brassica. I ate only a bite of it. It was the 15th of 24 courses that night and I’d had enough of meaty/savory. But she was very personable in visiting each table. Meanwhile, I think I’ve ended up licking the plate of everything Doug ever made. Imperial has spectacular service, and the portions are always generous at the chefs dinners I’ve had there and at Paley’s Place. We started with a cocktail of Imperial Punch and an appetizer from each chef as we enjoyed the hotel lobby/social space. Mei Lin’s albacore tuna and puffed rice bite was super – intricate, textured, delicious. I managed to snag two of them during the cocktail time. Doug’s crenshaw melon and kimchi salad bite was good. But I’d give that round to Mei Lin. We were seated in the side room, which unfortunately has acoustics that enhance the noise of conversation. Everyone at our table complained of it. Maybe we were in a bad spot, but it made it difficult to talk. 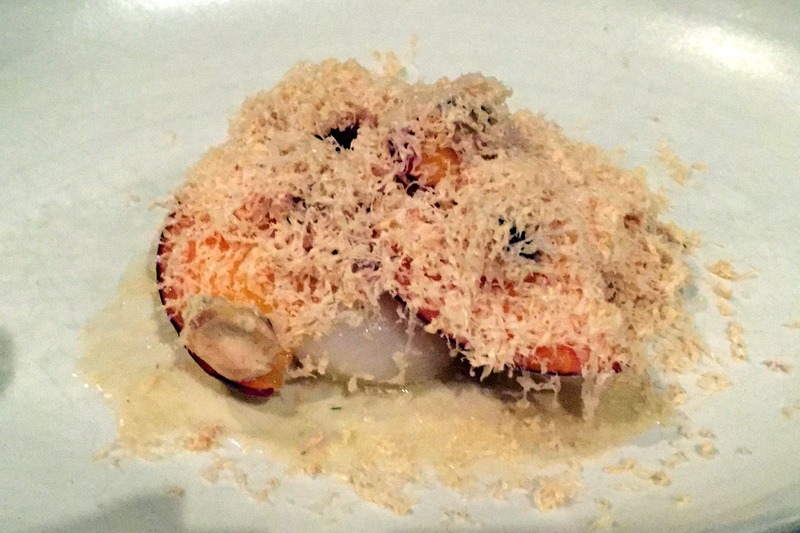 1st Course: Doug Adams – Bay scallops with thinly sliced peach dusted with shaved foie gras and toasted hazelnuts. 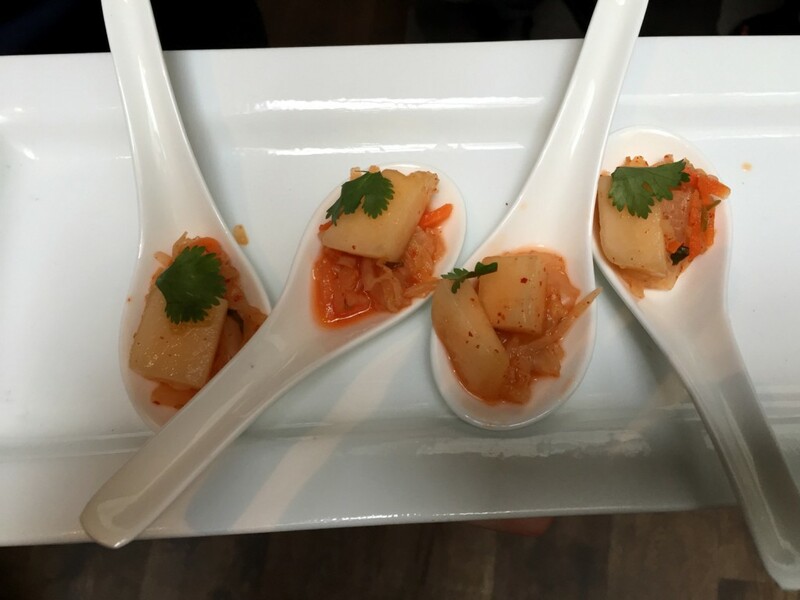 It was a dish that celebrated Imperial’s dedication to seasonal Northwest ingredients. Served with 2013 Ovum, Corral Creek Vineyard, Riesling. 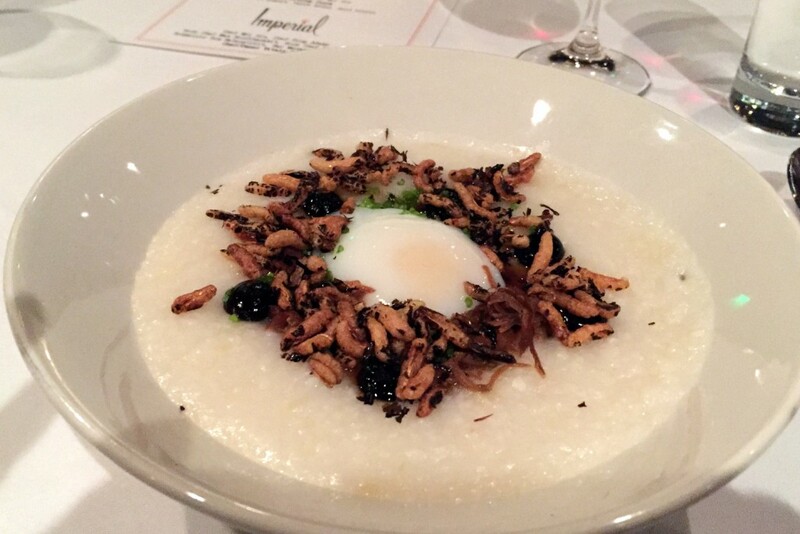 2nd Course: Mei Lin – Congee with duck, black garlic and puffed rice, with a soft egg in the center. She won the first round of Top Chef with a similar dish with carmelized pork, which is now a Blue Apron recipe. The serving we got was a large bowl, and we were instructed to mix it all together. This didn’t dilute any of the flavor (although the puffed rice didn’t stay crispy). The duck and garlic gave depth to each bite. It was a satisfying meal all on its own. I enjoyed the 2013 Belle Pente Pinot Noir (Willamette Valley) served with it. Mei Lin’s Congee with duck, black garlic and puffed rice. 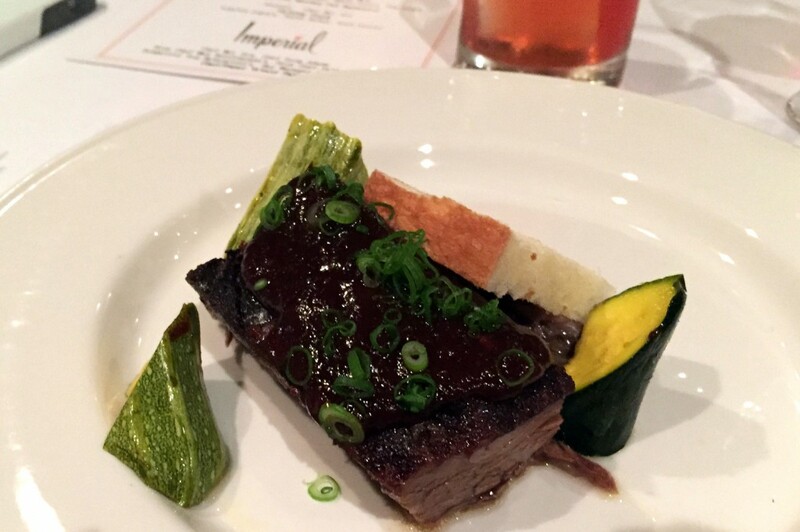 3rd Course: Doug Adams – 24-hour smoked short rib, with bbq sauce, bread & butter pickled summer squash and white bread. Wow. The rib was juicy, the sauce intricate with some heat, and the pickled squash refreshing to take a bite to cleanse the palate for the next bite of rib. This is a dish I would definitely recommend to anyone. It was served with a strawberry whiskey Old Fashioned. 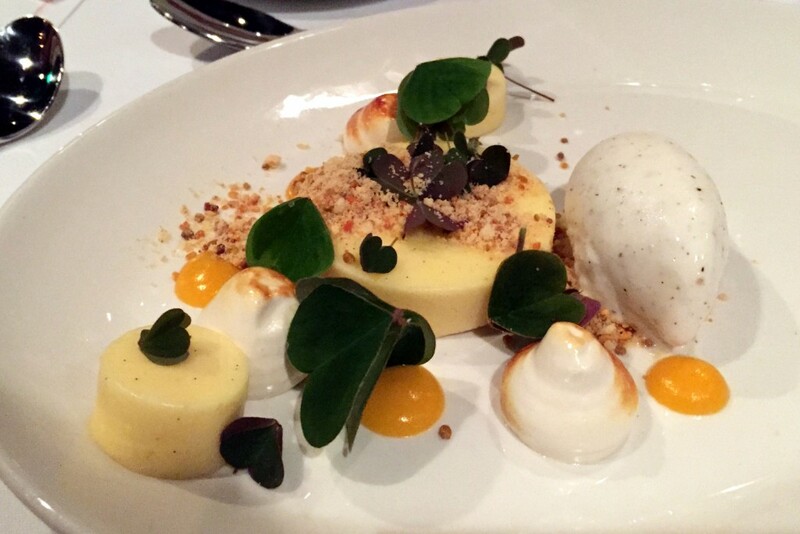 Dessert: Mei Lin – Citrus curd with toasted yogurt, burnt honey, ice cream and wood sorrel. Double WOW. This is a memorable dessert. I loved every bite, including the wood sorrel leaves (took me back to Outdoor School!). Served with coffee. The chefs visited with each table after each course and graciously posed for photos. 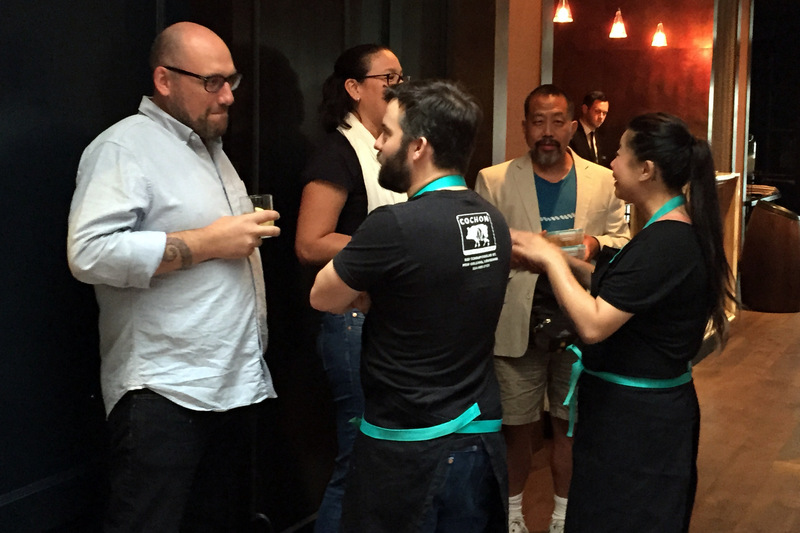 It was a very satisfying evening, and it’s always fun to finally taste what earned a chef their Top Chef win. Mei Lin’s courses were excellent. 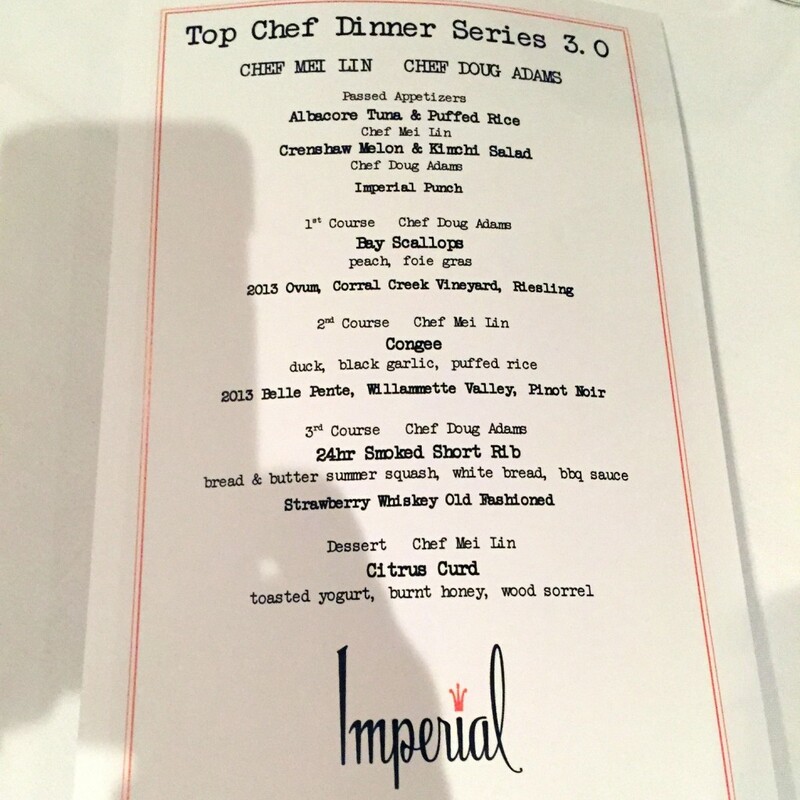 I’m happy to be able to eat at Imperial and Departure often as well!